I was first drawn to Junji Ito’s work by finding a copy of “The Enigma of Amigara Fault” online. At first, I thought it was a scanslation of a story not available in English otherwise… but as it turned out, it was one of the bonus stories in the second volume of Ito’s longer manga work, Gyo (or The Fish). “Enigma” is a great, creepy story — I could see something similar running in an EC comic, and that’s a high compliment. Gyo, the main story spread over two volumes, is likewise creepy and intriguing. It’s about rotting fish of all types that come up on land on metal legs, attacking the population of Japan. 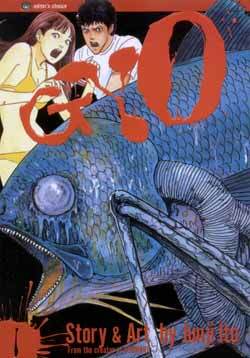 The beginning is great — with just one fish that comes upon the protagonist and his girlfriend, emitting a horrible stench, and about a quarter of the first volume just deals with this one, particular fish. It escalates from there — the main monster of the first book is a shark on legs doing, well, what sharks typically do, and the shark and its piscesian kin take over Tokyo, as well as the rest of the world. The second volume takes place a few months later, with most of the fish having completely rotted away, but the legs carrying new passengers — dead and bloated people. The thrust changes not from avoiding the fish and the sickness they carry, but the almost completely sick population trying to keep hold of their lives and sanity. Gyo isn’t perfect — in some aspects, the shorter “Enigma” is better paced due to its length, and some of the characterization isn’t great. For example, the protagonist’s girlfriend is one of the unfortunate character types common in both anime/manga and horror: The woman who’s not only irritating and shrill but an actual liability. She spends the first volume whining and complaining that her boyfriend’s not doing enough to help her while basically being absolutely useless without doing anything to help herself… that and when she’s not whining about how he’s not doing enough for her, she’s whining that he doesn’t love her. It’s that type of characterization that makes you wonder why he even puts up with her in the first place. She doesn’t NEED to be this way for the story to work, and it’d be much better if she wasn’t (after all, due to the nature of the situation, even if she WERE a little more self-reliant, it wouldn’t change the outcome a lick). But instead of a likable, real character, we just get an empty-headed vessel of annoyance. Still — the story is interesting enough to help overlook this (and, well, without spoilers, let’s just say she gets a lot less irritating about three-quarters through the first volume), and the addition of the two bonus stories are pretty good. The first, “The Sad Tale of the Principal Post” is a very brief story about the head of a family who gets caught under the main post supporting his family’s new house. The particulars don’t really make sense, but that’s not the point — it’s more a metaphor for the sacrifices one must make for their family. The second story, as mentioned above, is “Enigma”, which, like I said is a near-perfect horror piece. It’s about a mountainside which has lots of perfectly human-shaped holes that fit individual people — and these holes have an unnatural hold over people and draws them in. No one can really tell what happens in the holes, nor how deep they are, though the protagonist has a prophetic nightmare. The pacing is wonderful and it just grows and grows in dread and horror — it’s a must read. It’s not what you’d expect, but, honestly, “Enigma” is the headliner, and Gyo is the opener — a good opener that shouldn’t be missed, too…. but one would be forgiven for showing up late, too.